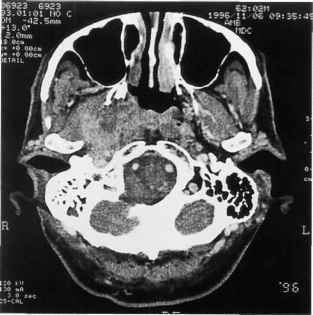 Figure 3.55 Nasopharyngeal carcinoma extending into the middle ear and external auditory canal. A polypoid mass infiltrates the tympanic membrane and partially fills the external auditory canal (see CT scan, Fig. 3.56 and MRI, Fig. 3.57). The patient was considered inoperable and was referred to radiotherapy. Figure 3.56 The CT scan demonstrates marked infiltration of the nasopharynx, the pterygoid muscles, and the petrous apex. 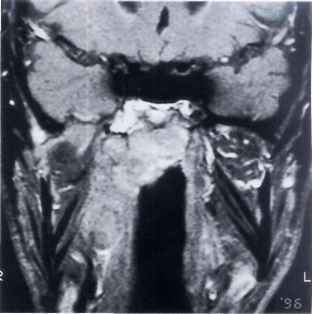 Figure 3.57 MRI with gadolinium confirms the infiltration. 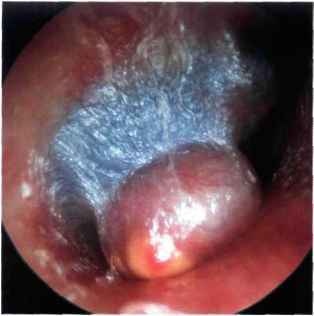 A carcinoma arising from the external auditory canal is frequently confused with suppurative otitis. Because of the high incidence of otitis externa and media and because these pathologies are frequently chronic, the diagnosis of carcinoma of the external auditory canal is almost always late. Diagnosis is made by biopsy. A high-resolution CT scan and MRI are necessary for proper evaluation. A high-resolution CT scan determines the osseous erosion caused by the tumor, whereas MRI is superior to CT for the evaluation of soft tissues. MRI shows the presence of dural invasion, intracranial extension, as well as extracranial soft-tissue involvement. Until now there has been no universally accepted system of staging, which is the basis for planning therapy and proper treatment evaluation. Therapy for carcinoma of the external auditory canal is almost always surgical. Various degrees of resection are utilized according to the extent of the pathology. Very small lesions can be managed by excision biopsy with a safety margin and curettage of the underlying bone. 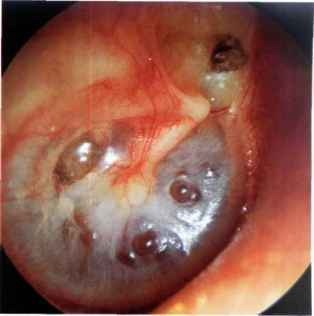 Lateral en-bloc petrosectomy is the treatment of choice in the majority of carcinomas of the external auditory canal. It entails excision of the external auditory canal (bone and soft tissues), tympanic membrane, and ossicular chain with preservation of the facial nerve. Anteriorly, bone removal extends up to the level of the temporomandibular joint. The cavity can be exteriorized or obliterated with abdominal fat and the external auditory canal closed as cul-de-sac. When indicated, the resection can include a superficial parotidectomy, resection of the mandibular condyle, and/or neck dissection. When the tumor has a deeper extension towards the middle ear, en-bloc subtotal resection of the temporal bone is indicated. 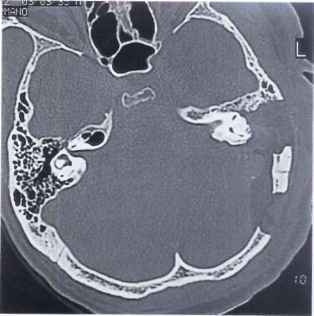 In such cases, a middle and posterior fossa craniotomy is necessary. Bone removal is performed up to the level of the medial third of the petrous apex and the internal carotid artery. The facial nerve and inner ear are sacrificed. A more extended procedure is total en-bloc resection of the temporal bone entailing, in addition, the sacrifice of the internal carotid artery, closure of the sig-moid sinus and jugular bulb, and in some cases a total parotidectomy and neck dissection. Secretory otitis media is characterized by the presence of middle ear effusion composed of a transudate/exudate of the mucosa of the middle ear cleft that is formed behind an intact tympanic membrane. 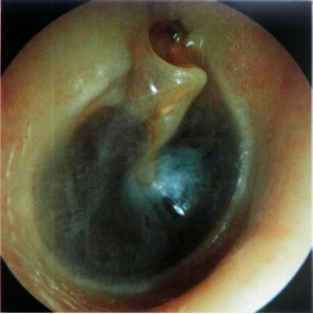 Classically, the tympanic membrane is retracted, immobile, dark yellowish or bluish, and thickened. At times, it may be transparent with a hairline (liquid level) or air bubbles visible through it. The causes are generally: eustachian tube obstruction secondary to mucosal edema due to infection (sinusitis, nasopharyngitis) or allergy; extrinsic pressure on the cartilaginous portion of the eustachian tube due to hyperplasia of glandular or lymphoid tissue or, rarely, due to tumors; malfunction of the tubal muscles as in children with cleft palate, or malformation of the tube itself as in Down's syndrome. Other factors that may contribute include: bacteriologic, immunologic, genetic, socioeconomic status, seasonal variation, as well as lack of transmission of specific immunoglobulins in non-breast-fed infants. All these factors cause tubal dysfunction or occlusion leading to negative middle ear pressure due to oxygen absorption by the mucosa of the middle ear cleft. 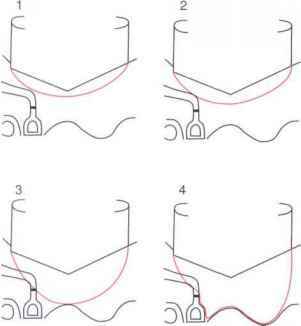 Normally, the tendency of the tubal walls to collapse at the level of the isthmus can be overcome by an increase in the nasopharyngeal pressure. 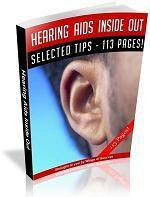 A negative middle ear pressure up to -25 mm Hg can be thus corrected. On the other hand, with edema of the tubal mucosa, the same increase in the nasopharyngeal pressure cannot overcome a negative middle ear pressure less than -5 mm Hg. In children, hyperplasia of the adenoid tissue is the most common predisposing factor, and nasopharyngi-tis is the most frequent cause of secretory otitis media. In adults, the condition is much less common and the presence of persistent unilateral otitis media with effusion can be due to a nasopharyngeal tumor that occludes the tubal opening, or a neoplasm that compresses or infiltrates the tube along its course. In cases that do not resolve despite proper medical treatment (nasal and systemic decongestants, mucolytics, and antibiotics) or in cases with persistent conductive hearing loss (see Figs. 4.1 and 4.2), the insertion of a ventilation tube is indicated. In children, adenoidectomy is also performed. Surgery aims at alleviating the conductive hearing loss avoiding the sequelae of otitis media with effusion. Sequelae include recurrent otitis media, tympanosclerosis, adhesive otitis media, retraction pockets with eventual cholesteatoma formation, and in some long-standing cases the formation of cholesterol granuloma (see Chapter 5). In this chapter, some typical cases of otitis media with effusion will be shown. For the surgical treatment (myringotomy and ventilation tube insertion), the reader is referred to Chapter 13 on postsurgical conditions. 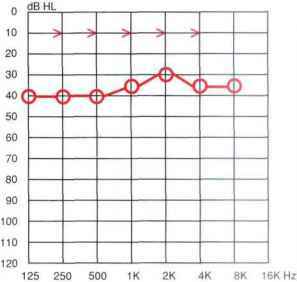 Figure 4.1 Conductive hearing loss. Bone conduction is normal. Air conduction is on an average of 35 dB. Figure 4.3 Right ear. Secretory otitis media. Air bubbles can be seen anterior to the handle of the malleus and also in the posteroinferior quadrant. Figure 4.4 Left ear. Secretory otitis media. Middle ear effusion having a reddish color inferiorly and a yellowish color superiorly. In this case, the differential diagnosis includes glomus tympanicum. If doubts still exist after microscopic examination, medical treatment is administered for several weeks and the patient is reexamined. Figure 4.5 Left ear. 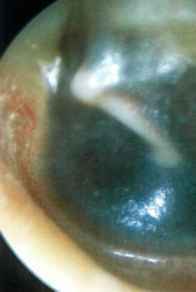 Secretory otitis media with an apparently dense transudate that gives the tympanic membrane the characteristic dark yellow color. 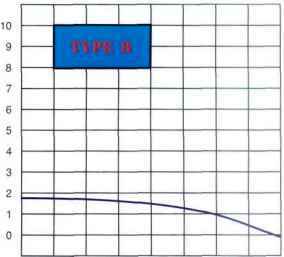 An air-fluid level can be appreciated at the poste rosu peri or quadrant. The tympanic membrane is diffusely hyperemic. If the condition is not resolved by medical treatment, a ventilation tube should be inserted. Figure 4.6 Right ear. The presence of glue in the middle ear leads to bulging of the tympanic membrane. In the posterior quadrant, a thinned area of the drum is visualized through which the yellowish color of the effusion is visible. This area would probably be the site of a future perforation. Figure 4.7 Right ear. Seromucoid effusion in the middle ear. Air bubbles can be seen in the anterior quadrants of the tympanic membrane. The patient is a 53-year-old woman who presented with a signs of right otitis media with effusion causing conductive hearing loss and ipsilateral paraesthesia of the maxillary and mandibular nerves, followed by episodes of trigeminal neuralgia and diplopia in the last few months. 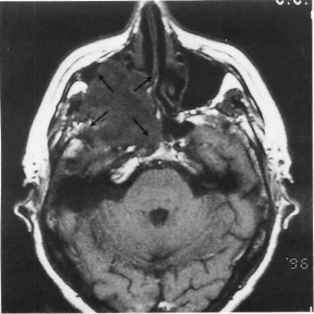 Computed tomography (CT) scan and magnetic resonance imaging (MRI) with gadolinium (see following figures) revealed the presence of a tumor (later proven to be a trigeminal neurinoma) with an intra- and extracranial extension. The tumor compressed the eustachian tube and resulted in the middle ear effusion. 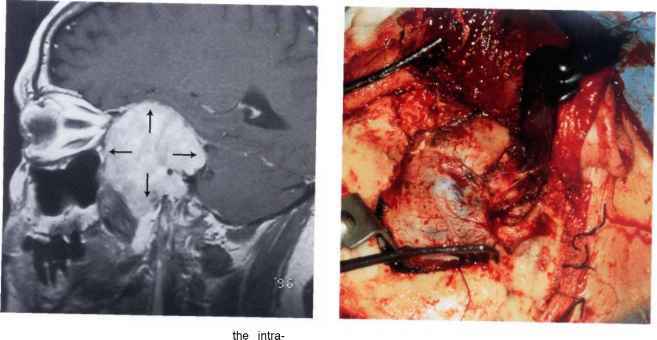 Total removal of the tumor was performed in a single-stage operation using an infratemporal type B approach with orbitozygomatic extension (Fig. 4.10). 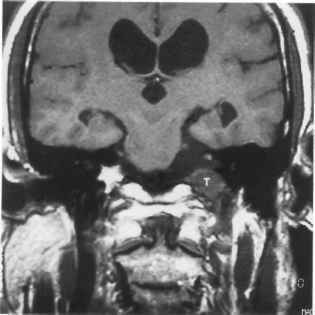 Figure 4.8 MRI, axial view, showing the extension of the giant trigeminal neurinoma. 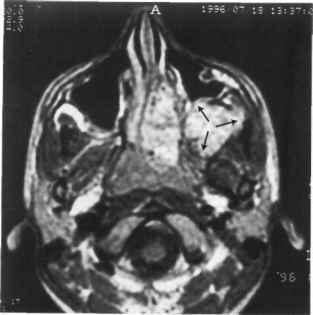 Figure 4.9 MRI, sagittal view, confirms extracranial extension of the tumor. Figure 4.12 A different case similar to the one in Figure 4.7. 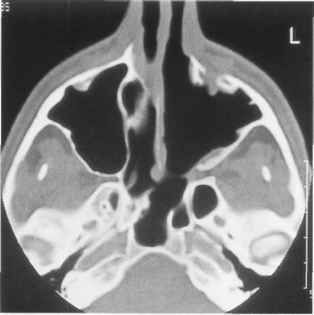 This 64-year-old woman complained of right nasal obstruction and a sensation of right ear fullness of 1 year duration. One month before presentation the patient began to suffer from neuralgic pain in the region of the maxillary nerve. 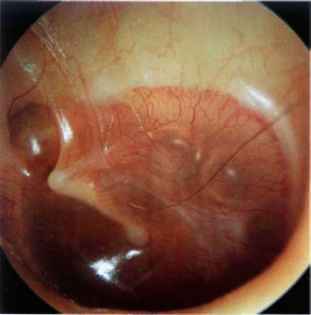 The tympanic membrane looks yellowish due to the presence of middle ear effusion (see following figures). Figure 4.13 Right nasal cavity, same case. A mass is visualized in the middle meatus. A biopsy proved it to be a neuri-noma. Figure 4.14 MR I of the same case. 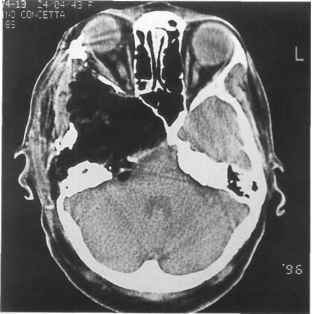 A huge trigeminal neurinoma with intra- and extracranial extension can be seen. 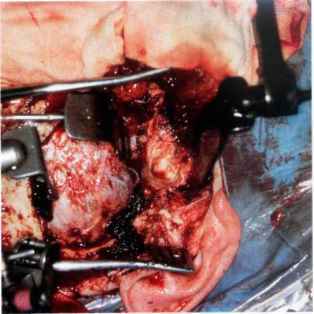 Figure 4.15 A single-stage, total removal was accomplished using a preauricular infratemporal subtemporal orbitozygomatic approach. Figure 4.17 Left ear. An air-fluid level is seen in a young patient with a juvenile nasopharyngeal angiofibroma. Figure 4.16 Postoperative CT scan showing total tumor removal. The floor and the lateral wall of the orbit have been reconstructed. Figure 4.18 MRI of the same case. The angiofibroma occupies the nasopharynx, pterygopalatine fossa, and infratemporal fossa on the left side. Removal was accomplished via an infratemporal fossa approach type C according to Fisch. Figure 4.19 Left ear. Secretory otitis media. The tympanic membrane is thickened. Catarrhal fluid can be seen through the relatively thinner anteroinferior quadrant. Figure 4.20 Right ear. Secretory otitis media. 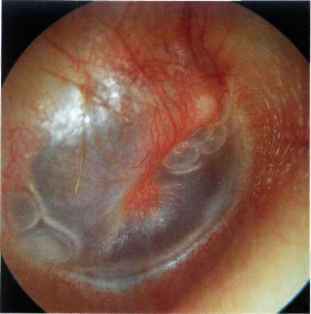 The effusion is visible through two thinned areas of the tympanic membrane lying anterior and posterior to the handle of the malleus. Figure 4.21 Right ear. Secretory otitis media with tympanosclerosis and epitympanic erosion. The tympanic membrane shows areas of tympanosclerosis alternating with areas of atrophy. Glue is present in the middle ear. Figure 4.23 Left ear showing a pulsating air-fluid level in a patient operated 1 year previously to remove a lower cranial nerve neurinoma using a petro-occipital trans-sigmoid approach (POTS) (see preoperative MRI, Fig. 4.24 and postoperative CT scan, Fig. 4.25). The patient complained of a sensation of ear blockage and watery rhinorrhea on leaning forwards. The middle ear is full of cerebrospinal fluid (CSF) passing through open hypotympanic air cells that communicate with the subarachnoid space. The CSF rhinorrhea was treated by obliterating the eustachian tube and middle ear with the temporalis muscle and by closure of the external auditory canal as cul-de-sac. Figure 4.22 Left ear. 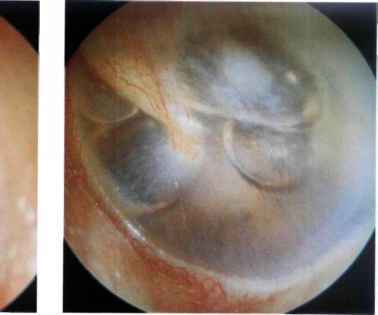 Otitis media with effusion and a whitish retrotympanic mass in the posterior quadrant at 3 o'clock can be observed. The presence of congenital cholesteatoma was considered in the differential diagnosis. 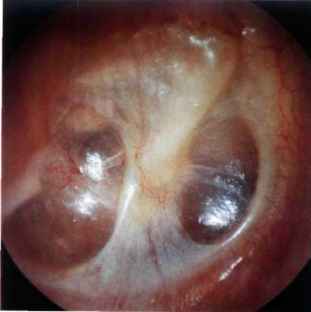 Exploratory tympanotomy showed only "glue" in the middle ear that was particularly dense in the posterior mesotympa-num. 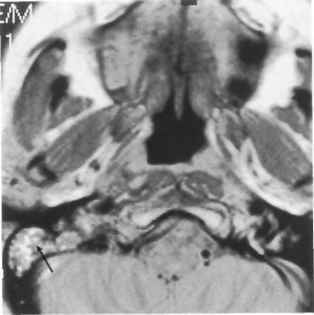 Figure 4.24 MRI of the same case showing a schwannoma of the lower cranial nerves (T). Figure 4.25 Postoperative CT scan shows the petro-occipi-tal craniotomy and the surgical cavity with preservation of the inner ear. Figure 4.26 Right ear. 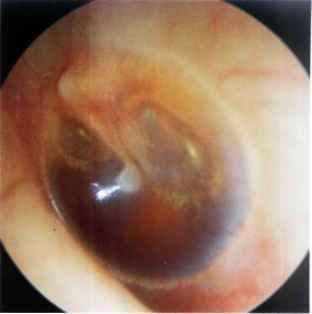 Otitis media with effusion in a 47-year-old female patient who complained of right hearing loss and a sensation of ear fullness of 1 year duration. Nasopharyngeal examination was doubtful. MRI (see Figs. 4.25 and 4.26) demonstrated the presence of a neoplasm at the level of the right Rosenmuller fossa. A biopsy was performed in this region and revealed the presence of an adenoid cystic carcinoma. The patient was operated on through an infratemporal fossa type C and then referred for radiotherapy. Small nasopharyngeal carcinomas can miss detection on MRI. Therefore, adults with unilateral otitis media with effusion, even with normal radiologic examination, should undergo biopsy of the nasopharynx under local anesthesia. Figure 4.27 MRI. Small neoplasm at the level of the Rosenmuller fossa (arrow). Figure 4.28 MRI. Effusion in the omolateral mastoid is clearly visible (arrow). Otitis media with effusion in children is generally bilateral. If it does not resolve despite appropriate medical treatment for a sufficient period, a myringotomy and the insertion of ventilation tubes are indicated. If necessary, adenoidectomy is also performed at the same setting. In all adult cases of unilateral prolonged otitis media with effusion, nasopharyngeal examination is obligatory to exclude nasopharyngeal carcinoma. In these cases it is often advisable to take a biopsy under local anesthesia. Biopsy is still indicated even if the radiologic examination proved normal. A biopsy should not be attempted, however, during endoscopic examination of the nasopharynx if the mass appears macroscopically vascular. Profuse hemorrhage can occur and may be difficult, to control. Cholesterol granuloma is a histologic term used to describe a foreign body, giant cell reaction to cholesterol crystals, and hemosiderin derived from ruptured erythrocytes. Cholesterol granuloma is thought to arise from obstructed drainage and insufficient aeration of cellular compartments of the temporal bone. This leads to reabsorption of air, negative pressure, mucosal edema, and hemorrhage. It can be present in the middle ear, mastoid, or petrous apex. Generally, patients with tympanomastoid cholesterol granuloma have a long history of recurrent otitis media or otitis media with effusion. 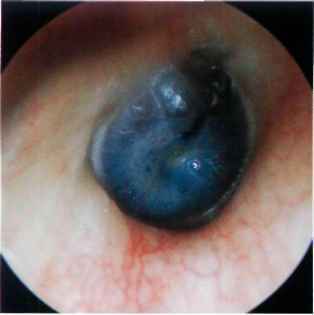 They also complain of conductive hearing loss, and on otoscopy the tympanic membrane appears bluish in color. 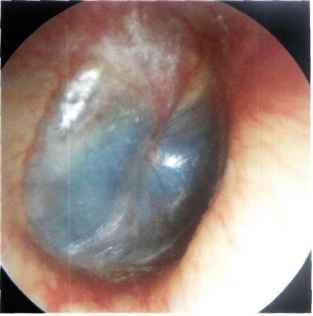 In some cases, where granulation tissue is more prevalent, cholesterol granuloma can present as a retrotympanic reddish-brown mass that may cause bulging of the tympanic membrane, thus mimicking a glomus tumor. In these cases, a computed tomography (CT) scan is sufficient to clear any doubts. A cholesterol granuloma rarely causes bone erosion. On the contrary, bone erosion is characteristic of glomus tumors causing destruction of the jugular hypotympanic septum with an irregular "moth-eaten" contour. In the initial phases, before cholesterol granuloma is formed, it might be sufficient to insert a ventilation tube, thus preventing further development of the granuloma. When the granuloma has already been formed, it is necessary to perform a tympanoplasty with mas-toidectomy that opens the intercellular septae with subsequent aeration of the middle ear and mastoid. Figure 5.1 Right ear. Typical blue tympanum caused by cholesterol granuloma. The blue color is due to hemosiderin crystals. The granuloma involves not only the middle ear but generally extends into the mastoid air cells. Figure 5.2 Blue tympanum caused by cholesterol granuloma. 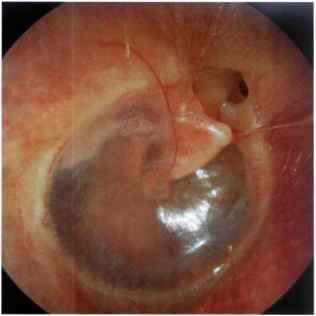 An epitympanic retraction due to eustachian tube dysfunction is also present. inflammatory polyp that leads to bulging of the tympanic brane caused by a cholesterol granuloma. Figure 5.5 Axial CT of the case described in Figure 5.4. The Figure 5.6 Coronal CT scan of the same patient. granuloma and the effusion are present in the middle ear and mastoid without causing any bony erosion. The ossicular chain (malleus and incus) is intact and the intercellular septae in the mastoid are preserved. Figure 5.7 Left ear. 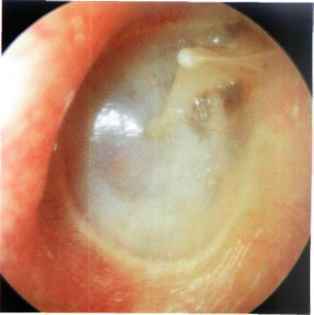 A 17-year-old male patient complained of conductive hearing loss of 1 year duration accompanied by left nasal obstruction. 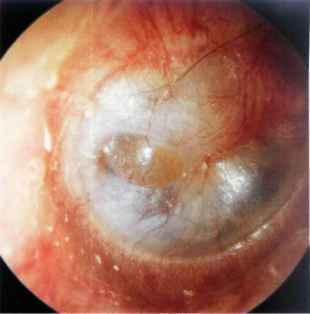 Otoscopy revealed the presence of a left cholesterol granuloma. Rhinoscopy showed the presence of a nasopharyngeal swelling that extended into the left nasal cavity. The swelling was suggestive of a juvenile nasopharyngeal angiofibroma. Figure 5.8 CT, coronal view. 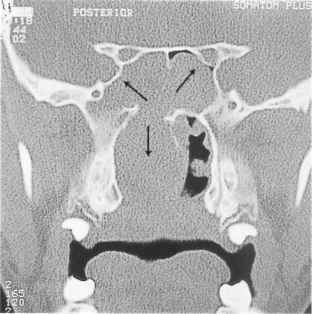 Involvement of the nasopharynx and the sphenoidal sinus. Figure 5.9 Magnetic resonance imaging (MRI) of the same case, coronal view, showing the extension of the angiofibro-ma. Figure 5.10 MRI of the same case, sagittal view, showing the extension of the tumor from the ethmoid to the rhinopharynx pushing the soft palate. Figure 5.11 MR I of the same case, axial view. Involvement Figure 5.12 The angiofibroma was removed, after being of the middle ear and mastoid by the cholesterol granuloma embolized, using a midfacial degloving approach, can be observed. Figure 5.13 Postoperative CT (1 year) confirming the total tumor removal. Adhesive otitis media is characterized by complete or partial adhesions between the thin retracted and atrophic pars tensa and the medial wall of the middle ear. Necrosis of the long process of the incus or the stapes' suprastructure can also occur with a resultant natural myringostapedopexy. It should be differentiated from atelectasis and from simple drum retraction in which the tympanic membrane is mobile with the Valsalva or Toynbee maneuvers. Sade (1979) distinguished five grades of atelectasis (Fig. 6.1): grade I is characterized by a mild retraction of the tympanic membrane; in grade II the retracted tympanic membrane comes in contact with the incus or the stapes; in grade III the tympanic membrane touches the promontory; grade IV is adhesive otitis media; and in grade V there is a spontaneous perforation of the atelectatic ear drum with otorrhea and polyp formation. Nakano (1993) proposed two types of adhesive otitis: type A in which the retracted and atrophic tympanic membrane adheres completely to the promontory, and type B in which retraction and adhesion affect mainly the posterior part of the tympanic membrane, usually without retraction of its anterior half. Histologically, the tympanic membrane is atrophic due to thinning or even absence of the lamina propria. It can be hypothesized that the negative middle ear pressure caused by eustachian tube dysfunction or persistent secretory otitis media leads to atrophy of the elastic fibers of the pars tensa. 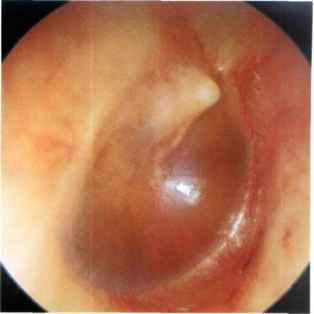 An occasional episode of acute suppurative otitis media might form adhesions between the mucosa of the promontory and the retracted tympanic membrane. Figure 6.1 Classification (modified) of atelectasis according to Sade (1979) (see text). Figure 6.2 Right ear. Grade I atelectasis according to Sade (1979). The tympanic membrane is retracted but does not come into contact with the middle ear structures. A mild retraction of the pars flaccida, through which the head of the malleus is visible, is also noted. The base of the retraction pocket is under control with no sign of cholesteatoma. It is also possible in this case to assume that the drum is mobile on Valsalva or Toynbee maneuvers. This patient presented with very mild conductive hearing loss and a normal tym-panogram (type A) (see Figs. 6.3 and 6.4). Can Nasopharyngeal cancer be found on a cervical MRI? Can lymphoma cause bulging of the tympanic membrane? What is the fluid coming out from nasopharyngeal? 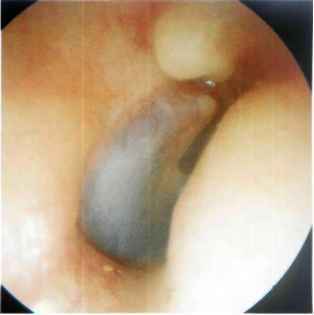 Is the malleus visible in a normal tympanic membrane? What does it mean when bubbles of air visible in the tympanic membrane? Is it appropriate to bill for removal of ear polyp and removal of ear tube on the same ear? What color is an ear tumor? What color is a healthy eardrum? Why hyperemia during retraction of tympanic mebrane? Are there ct scan to see the inner and middle ear fluid?